Email sign up forms, or web forms, are subscription boxes you can add to your site, blog, or social page to collect new email subscribers. 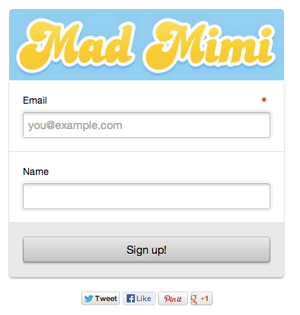 All sign ups collected through your email web form get added directly into your Mad Mimi Audience. When you create a registration option specific to your email list, you know sign-ups are definitely interested in receiving your content! The best place to add an email signup form is somewhere prominent on your website, like your sidebar. If you like to include customers in your email list, it’s also best practice to include a separate email sign up option during your purchase process. What Information Do You Need To Collect? Often, just an email address works. Keep it simple. If you don’t need additional details for your email marketing, don’t include it in the form. The most common fields to include in a web form are name and email. Here’s a collection of email signup form tutorials, click any topic for step-by-step details. Embed Options: How to embed your web form on your website. Theme Options: Learn about the web form style tools. Manage Subscriptions: Allow your readers to control their own list subscriptions. Highwire: An ecommerce platform with signup form tools. Jotform: An independent web form builder that syncs with Mad Mimi signup forms. Wibiya: Add your signup form to a customizable site bar for your website. WordPress: Mad Mimi’s WordPress Plugin! Use it to add a web form to your WordPress site. Facebook: Add a sign up form to your Facebook business or fan page.